Leiden Arts in Society Blog - Articles - For practice or preaching: why do academics blog? For practice or preaching: why do academics blog? Blogposts can be published quickly, linking to current events and other media. They're a means to engage in an ongoing discourse, and to practice your writing (and they get read more than articles). Let's explore the many reasons why academics should blog! The piece now in front of you is the 125th post on the Leiden Arts in Society Blog -- that is, if I’ve counted correctly. That’s a memorable number of contributions, and the blog has now been up and running for a year and eight months, one new blogpost being published each week. It’s especially festive when you take into account that many blogs do not ‘live’ that long: although there are an estimated 150 to 200 million blogs out there (depending on whose figures you extrapolate), Perseus once calculated an average lifespan of only 126 days. * And according to Caslon Analytics, 60-80% of blogs were abandoned even within a month after their creation. * Not only is The Leiden Arts in Society a positive exception to the average blog-life expectancy, it also stands out because it’s a collaborative effort driven (almost) exclusively by PhD candidates. This is rare: one study found only 6% of academic blogs are hosted by PhDs. All the more reason, then, to reflect on this practice here. Let’s start with a basic question: why do academics blog? Google that question, and an answer will come up (at least, as the first suggestion I got this) that is as cynical as it is simplistic: academics should blog, because our inaccessible, jargon-heavy journal articles don’t get read. Although that sinister analysis about research papers may hold some truth (see also my earlier post on academic papers going unnoticed, and this one on the general audience’s interest in research articles), a more constructive approach does more justice to the thriving genre: what is so unique about the blog, that this text form is so popular? Of course, I am not at all the first to ask this question. There is a considerable amount of research on the phenomenon of blogging, and much of it enquires into bloggers’ motivations for contributing to the genre. Blogging academics (or: academic bloggers?) are described reporting quite consistently the same motivations, dubbed by Alexander Havalais in 2006 as ‘the notebook, the coffee house, and the opinions page’. Firstly, academics treat the blog as a sketch pad, a tool they can practise their writing skills on, by experimenting with tone, topic, and style in writing about their research. This use is widely acknowledged, and even advocated as training for PhDs. Secondly, they regard blog platforms as virtual coffee houses, or common rooms: they appreciate the informal gathering of like-minded readers on a platform, and the fact that they can share ideas with the community. Thirdly, academics report that they feel the blog is a good outlet for any opinions, be they related to their research or to academic culture at large, whereas other text types are set strictly in a research field. This use was demonstrated in a 2013 study for The Guardian, where in a sample of 100 academic blogs no fewer than 41 contained reflections on, or critiques of, academia’s cultural practices. 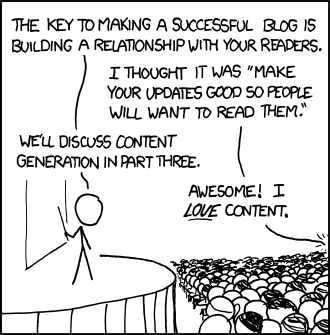 XKCD – ‘Blogging’. Available in CC-NC 2.5, via https://imgs.xkcd.com/comics/blogging.png. Like most things that come in threes, this triad of authors’ motivations for blogging sounds fun and convincing, but it cannot be the whole explanation. After all, academics already have the notebooks, common rooms, and opinion pieces that the metaphor refers to -- why, then is there room for a new medium? An answer to this question may be found by approaching the blog as a distinctive text type, with its own set of salient characteristics: inherent technological properties of a medium, that steer and shape the use of that medium as much as social forces, such as readers’ expectations and authorial intent, will do. 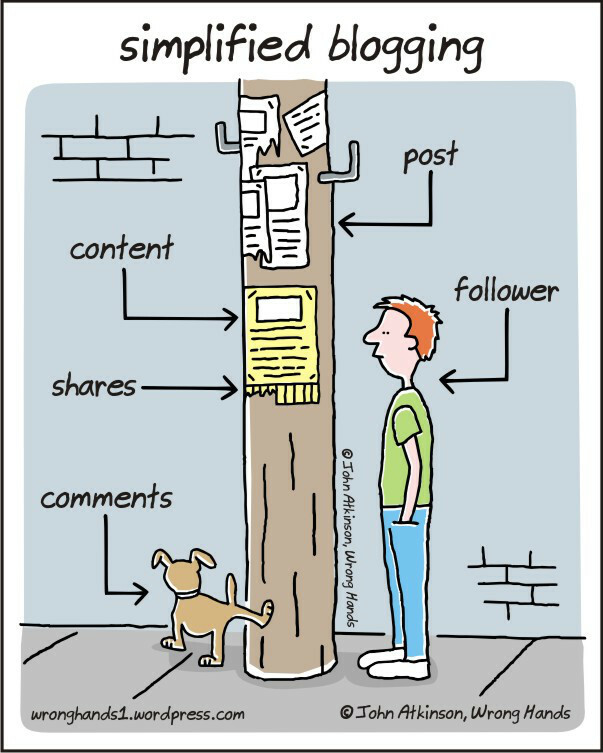 Cartoon by John Atkinson, via wronghands1.wordpress.com, CC BY-NC-ND. This quick, unmediated and direct method of publication renders blogs the perfect medium to connect with current events, in contrast with research articles, that usually take months of processing and lots of scrutiny to get published. Lastly, the online-only nature of blogs forces authors to ground their posts firmly in other online content, via links to websites and other blogs. This is a dynamic substitute for the static references and citations to other academic texts that traditional print-based publications are ridden with. So, in short: blogs are the ultimate tool for academics to send out opinionated pieces about their research or related matters, concurrent with news and events, and connected to other online media. This is the niche that the blog occupies in the ecology of scholars, text types, and technology. Merely seeing the blog as a sketch pad or virtual coffee corner doesn’t do justice to its salient properties: academic blogs serve to add researchers’ thoughts to online discourses, thoughts that are valuable precisely because they are carefully constructed and argued from a scholarly background. The translation of academic ideas is therefore both a consequence of the text form’s salient properties, as well as a further reason to advocate blogging. As scholar and blogging enthusiast Mark Marino once put it in the Chronicle of Higher Education: “My dream for this [academic blogging via popular websites, FP] is that you eventually get locked in a click-bait loop of scholarly arguments, rather than articles about Disney princesses and what to do in your 20’s.” That sounds like an ambitious goal, but I like the idea of contributing to it! * Disclaimer: the reported statistics come from Perseus’ survey in 2003, and Caslon’s study in 2007, and both were linked to in the original version of this post (dating from January 2016). Unfortunately, as happens often with materials by private companies, both reports are now offline. In this updated blogpost, I therefore had to make do with linking to web-pieces quoting the original research. One of the earliest scholarly analyses of blogging: Alexander Halavais, ‘Scholarly blogging: Moving towards the visible college’, in Axel Bruns &. Joanne Jacobs, Uses of Blogs (New York: Peter Lang, 2006), pp. 117–126. Do you think that new technologies shape the way we communicate with each other, or do you think that our social needs and preferences mould our communication technologies? This was a main divide (at its peak in the nineties) between technological determinism and social constructivism in media studies. Most media theorists now agree that the answer to the question is not an either/or, but should be a nuanced description of how new technologies influence our actions, and how users’ preferences shape the properties of our new technologies in turn. LUCAS-professor Adriaan van der Weel analyses the salient properties of textual media as well as some of its implementation and subsequent developments in his book Changing Our Textual Minds (Manchester University Press, 2011). © Fleur Praal and Leiden Arts in Society Blog, 2018. Unauthorised use and/or duplication of this material without express and written permission from this site’s author and/or owner is strictly prohibited. Excerpts and links may be used, provided that full and clear credit is given to Fleur Praal and Leiden Arts in Society Blog with appropriate and specific direction to the original content. How to share your research with the world?